No idea why they never finished the paint job in this room. 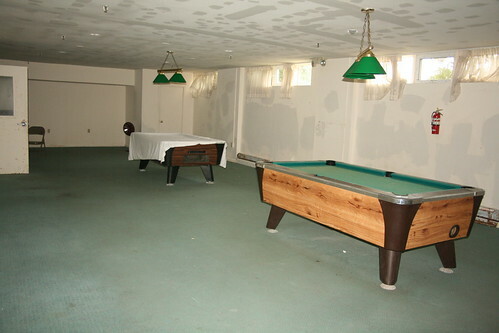 It was definitely an active billiard room when the hotel was open. I suspect that water damage had effected the walls, and the owners decided to spruce up the walls in this one area hoping to sell the property. It was very close to the main lobby, and located centrally in the main building, so presumably if this room looked forlorn it might scare away potential buyers.